There are two basic types of burglar alarms available on the market today – hard-wired and wireless. The most significant difference is that the former has to be wired directly into the home’s electrical source whereas the latter alarms do not. However, both are effective deterrents and help to prevent being victimized by a burglar. Originally, all burglar alarms were the hard-wired type. However, with advancements in technology and numerous innovations, the wireless systems have moved to the forefront. Cost – budget is always the primary consideration here and despite the fact that wireless burglar alarms may cost less initially, once you add the charge for installation into the equation, the overall cost is significantly less expensive. Convenience – wireless systems are very convenient and easy to install. There’s no drilling through walls, no moving of furniture, and patchwork to be done. Additionally, if you are a savvy DIY’er, installing a wireless system is much simpler. Security – despite all the talk regarding hacking into wireless systems to disable them, this is not that easy to do. 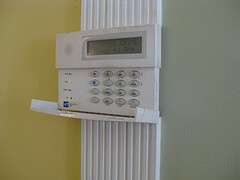 Wireless burglar alarms are normally safe and secure. Besides that, if the person is a skilled hacker, they will make much better money doing something else besides burglarizing your home. Coverage – because of the damage to walls in the home, there used to be a lot of constraints involved with installing hard-wired burglar alarms. There are still issues where this is concerned but with a wireless system, these issues are all but eliminated. Since there are fewer if any constraints involved with wireless systems, you can easily increase your coverage. Expandability – it is extremely easy to add onto and expand wireless burglar alarms compared to hard-wired systems. Extra detectors and sensors are easy to add in order to cover a large number of “zones” within the home. Basic systems will monitor up to 8 zones but with the expandability involved with wireless systems you can triple or even quadruple that coverage. Next post: Why does home security involve more than burglar alarms?